This unique cocktail table will be a perfect distinctive addition to your home. 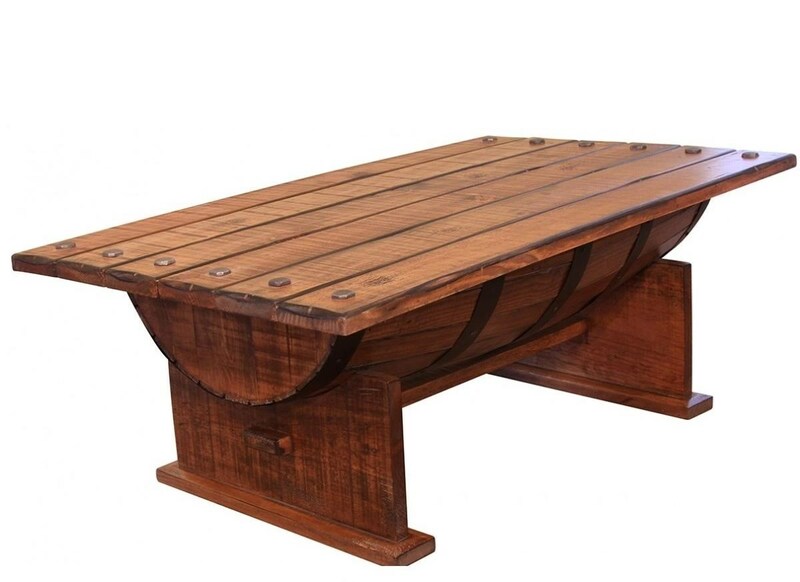 The base of the table looks like it has been fashioned from half of a barrel and is hand crafted with added iron for an authentic look. The rich chocolate finish brings out the natural grain of the solid wood construction. The Bourbon Barrel Cocktail Table by International Furniture Direct at Furniture Mart Colorado in the Denver, Northern Colorado, Fort Morgan, Sterling, CO area. Product availability may vary. Contact us for the most current availability on this product. Case Construction Solid pine with iron accents. The Bourbon collection is a great option if you are looking for Rustic Industrial furniture in the Denver, Northern Colorado, Fort Morgan, Sterling, CO area. Browse other items in the Bourbon collection from Furniture Mart Colorado in the Denver, Northern Colorado, Fort Morgan, Sterling, CO area.